jumped into my grocery cart. Okay, you can go home with me. The flowers say it all. 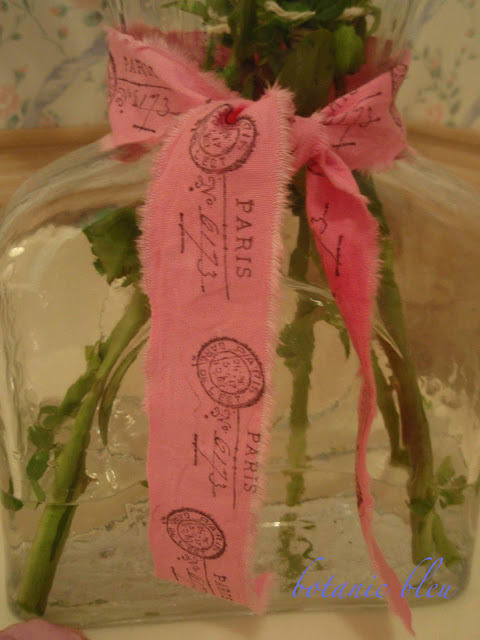 Brown edges enhance the pink petal and reflect the ribbon's colors. that draws attention to it instead of the arrangement. Is that not what happens in France? and captivate your eyes and heart. I do believe we think alike. I have 8 new chicks and some of them will be Pies,which means mixed. 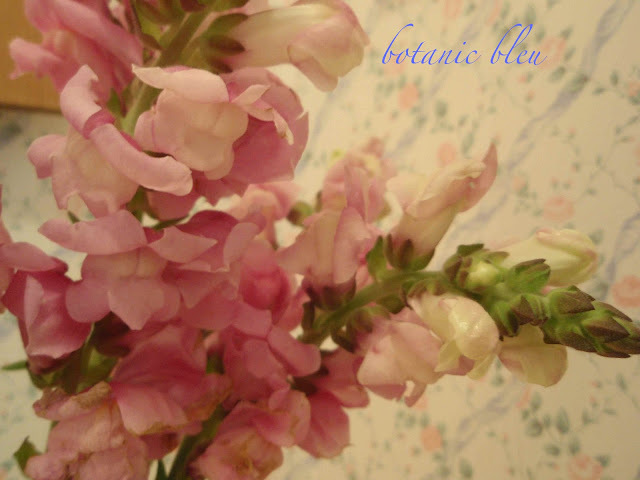 Beautiful Snapdragons! I really like the fact that you mentioned the spent blossom. I enjoy all the stages of growth, especially flowers. It's nice to know someone else appreciates that too. Your flowers are so lovely. I LOVE that homemade ribbon. It's fabulous. 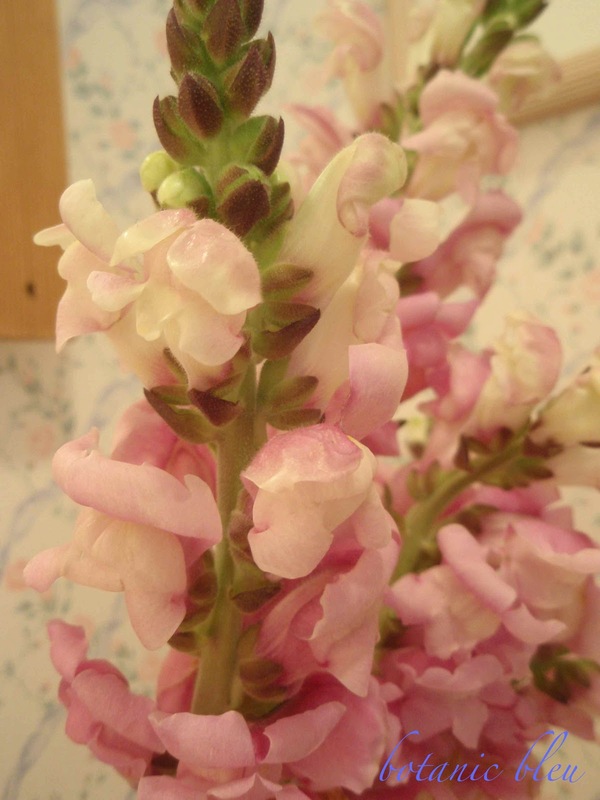 Snapdragons were my very favorite flower when I was a little girl. This post brings back memories of my Grandmother's garden...when my fingers were tiny enough to make pretty dragon finger puppets. Did you make the ribbon, Judith? It's beautiful! Love the snapdragons! Haven't grown them at this house, but used to always buy plants to put in other places we've lived. Just love the tall spikiness with the soft edges. 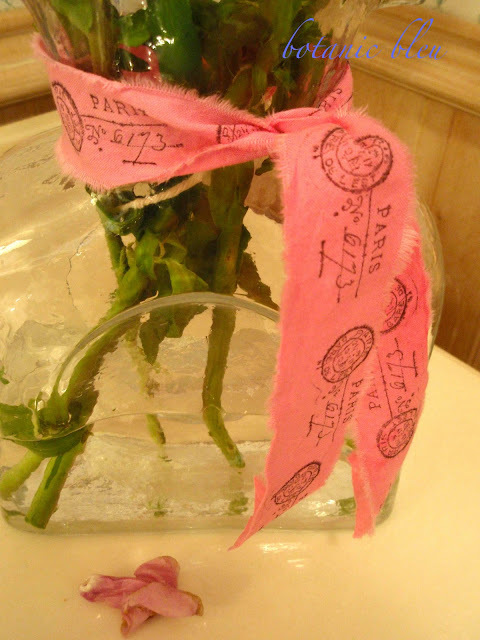 The hand-made Paris ribbon is gorgeous. I'm itching to make some, but have major commitments this week so it will have to wait. 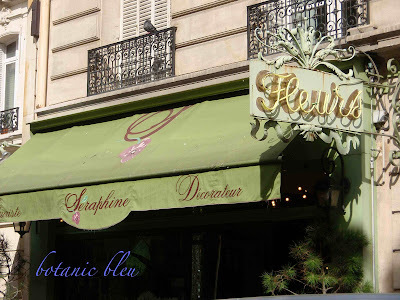 Lovely post, Judith! Love flowers !! 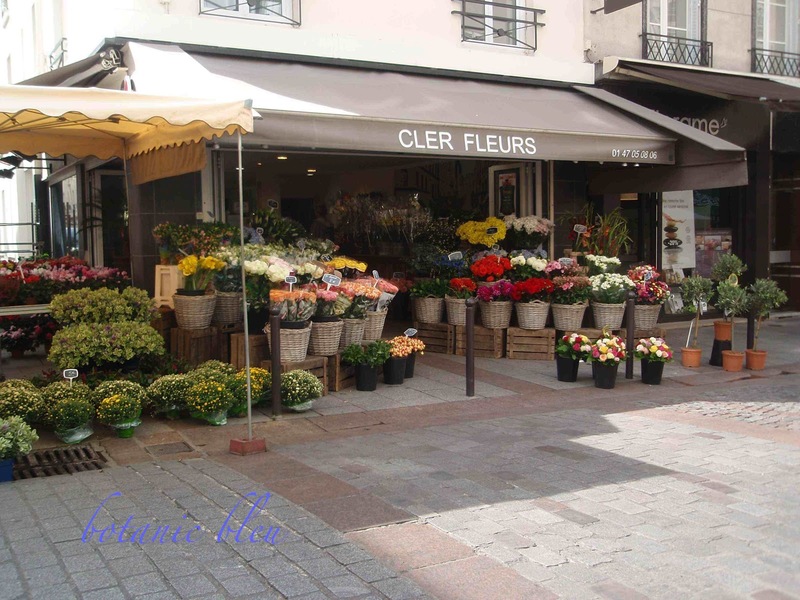 !...did you know we have a flower shop ?? ?...lovely weekend...love Ria...x ! 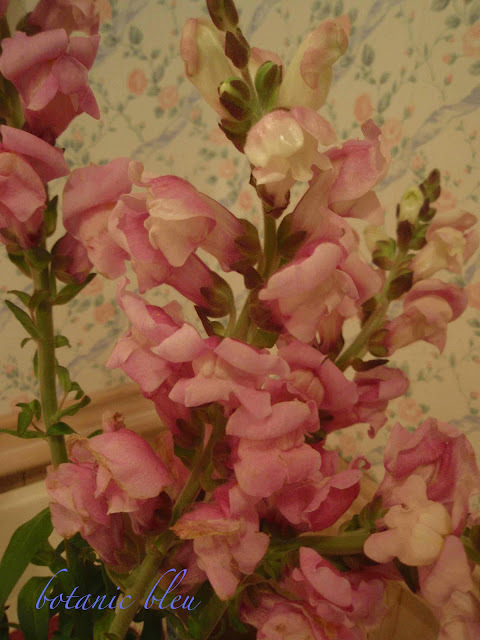 I've loved Snapdragons since I was little, we used to make them "talk" by moving their little "jaws". doesn't take much to entertain me. love the pink stamped ribbon, too! I love Snapdragons. Your post is beautiful, Judith! 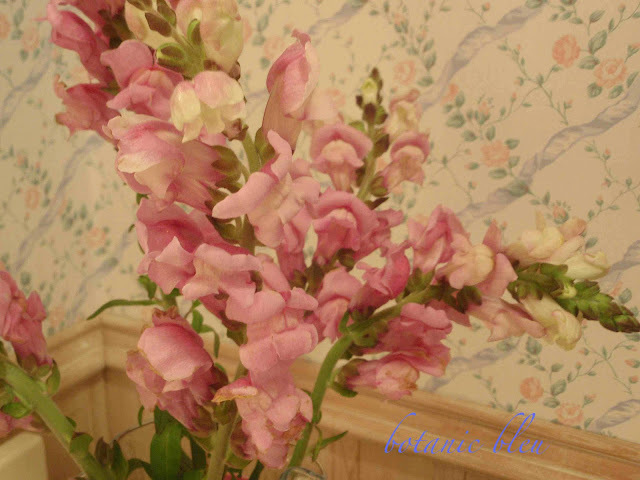 Beautiful blooms and they do look amazing with the wallpaper...so pretty! 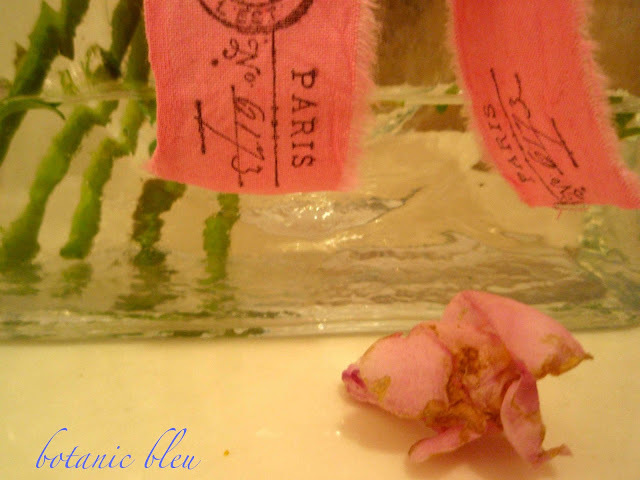 Your bathroom vignette is so pretty. I like the wallpaper and the sink! Is that a cobalt blue? 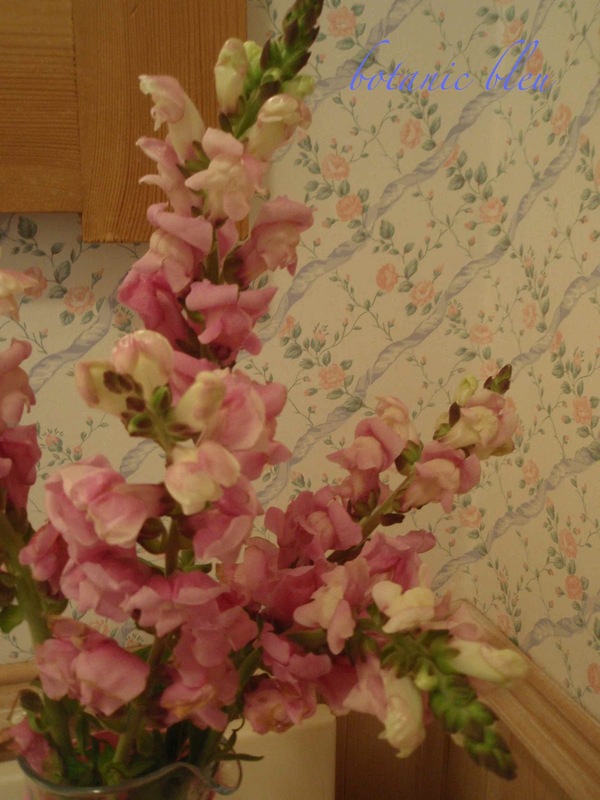 The snapdragons add a nice touch of pink to complement the pink on the wall. 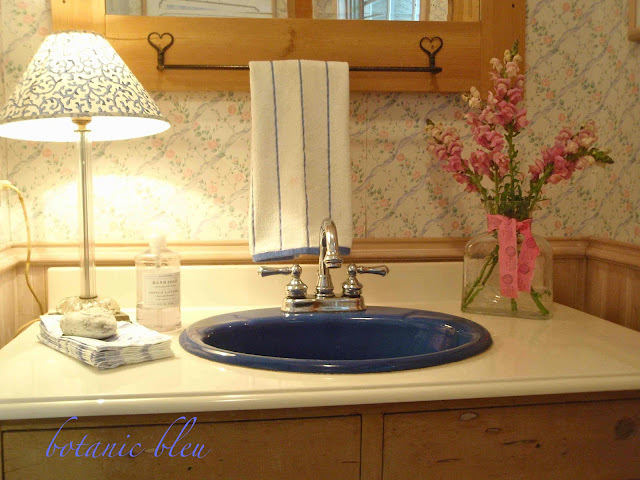 Love the towel bar - I have a number of black iron pieces with hearts so I noticed it right away. I like the simple and charming way you displayed your snapdragons. They are luscious in their colouring! The flowers say it all! Thank you for sharing.